Graphic Design, Yoga, Travel…my life! 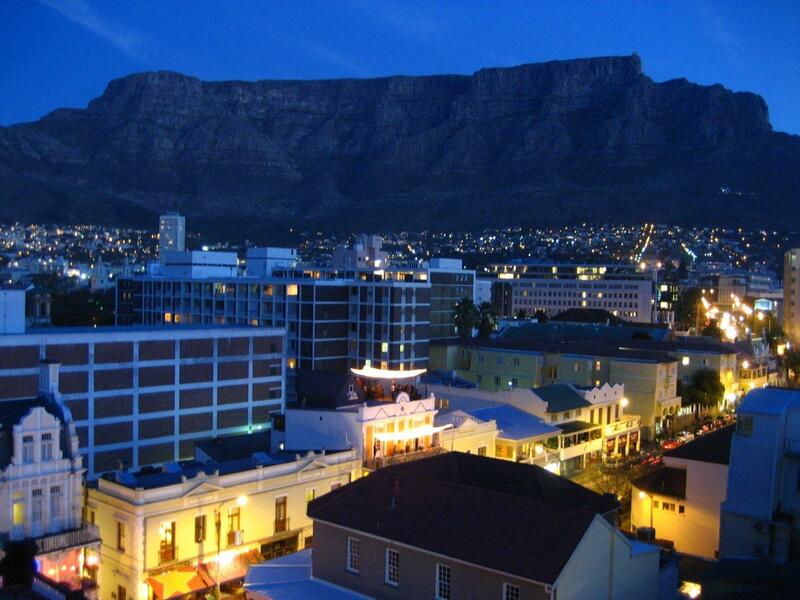 We arrived in Cape Town around 5pm and made our way to the apartment we rented right off of Long St. Long is similar to Tempe’s Mill Ave. or maybe even Bourbon St. in new Orleans. (except for the excessive blowing vuvuzelas). 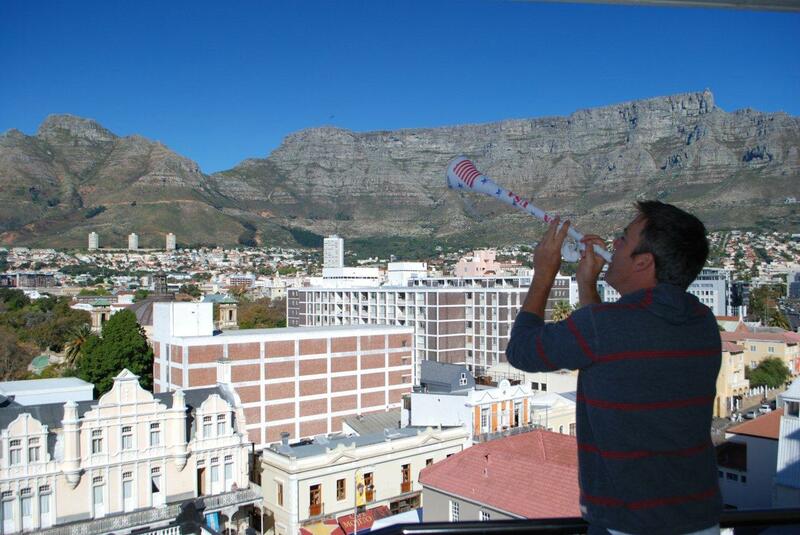 We stayed at an apartment building called “Flatrock” on the top floor and had a killer view of Table Mountain and Long St.
laces were packed so we tried a new restaurant called “Meat Co.” which just opened for WC visitors. Not bad, but they were out of steak (really?) and our “rolls” actually came as platters. All in all it was still good, but shark diving took a lot out of us and we headed to bed soon after. 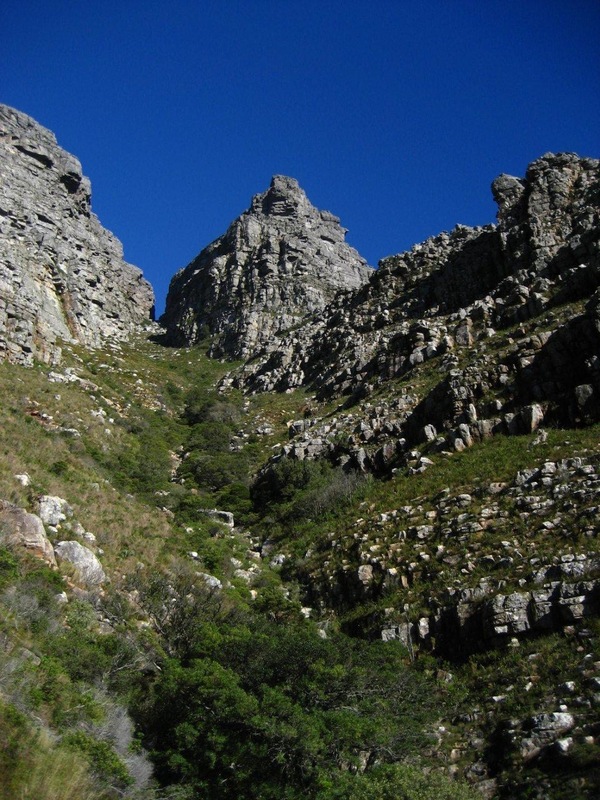 The next morning we woke up to a gorgeous sunny day and figured we HAD to hike Table Mountain. We got there early and snagged a good parking spot close to the trail head, so we decided we should hike it instead of taking the cable car to the top. It was a beautiful, scenic hike, but it was HARD. Think about climbing vertically for a good few thousand feet (Note: for you Phoenicians out there, it’s about twice the size of Camelback – Echo Canyon trail). I recommend doing it though, you don’t get anywhere near the same experience taking the cable car and the scenery on the way up is unbelievable. 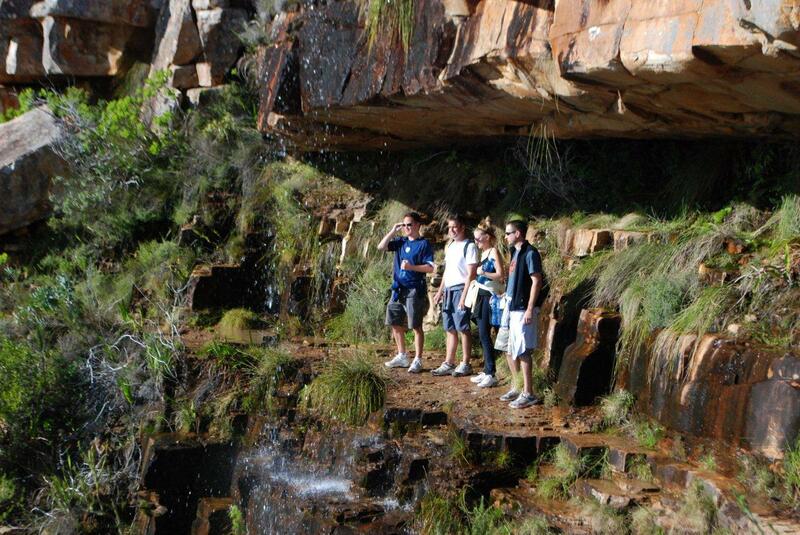 You have a panoramic view of Cape Town as you’re walking under waterfalls. Our weather was perfect, warm in the sun and cool in the shade with killer views of the city and waterfront. 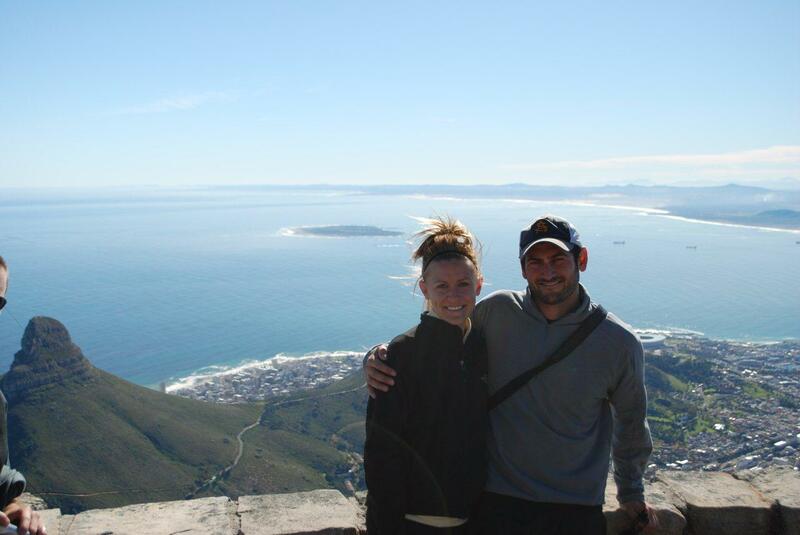 Once on top, we took some photos and grabbed a snack in the cafe/restaurant then took the cable car down. They have a great little cafe up there as well as tourist shop, toilets, phones, etc. The cable car has a moving floor so you get a 360 degree view of the ride. We headed to the V&A Waterfront to catch the USA v. Algeria and England v. Slovenia matches on TV at “Quay Four” a great waterfront restaurant/bar that served beer in liter tabletop taps and we joined some South Africans at their nice couch setup right in front of a flat screen and fireplace. The bar was probably 80% Americans and 20% English and the entire place was packed wall to wall once the matches started. 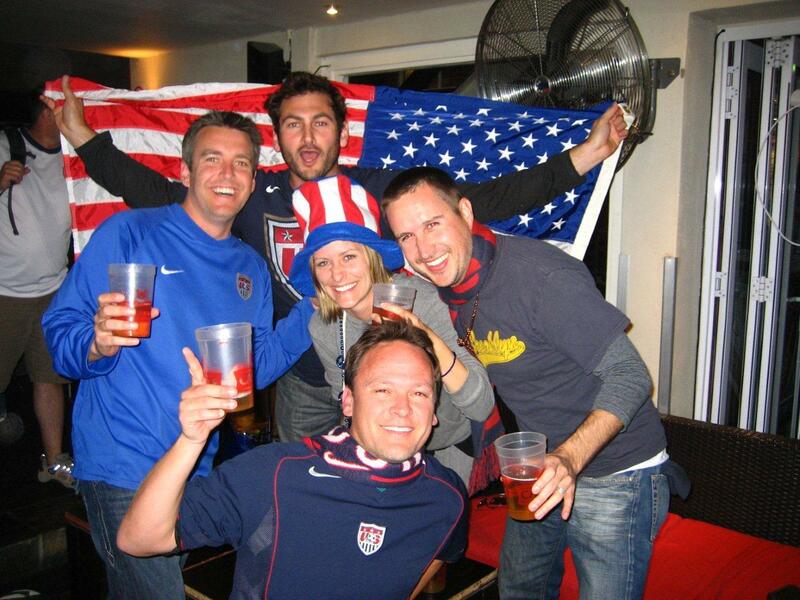 When Landon kicked that insane goal and the US finally beat Algeria in injury time, the place went nuts!! 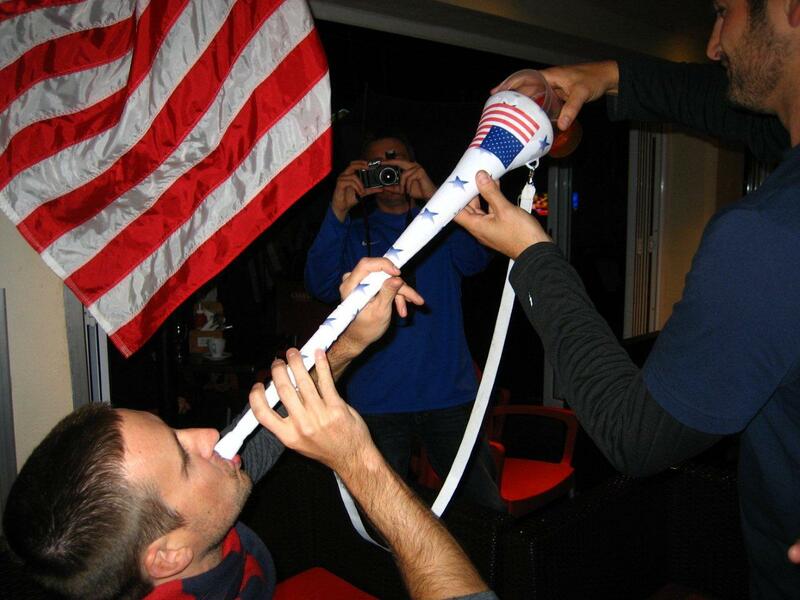 We were all buying shots for each other and singing and dancing around and even starting a new trend – vuvuzela beer bonging. It was definitely a night to remember (or not haha). I'm King of the World! 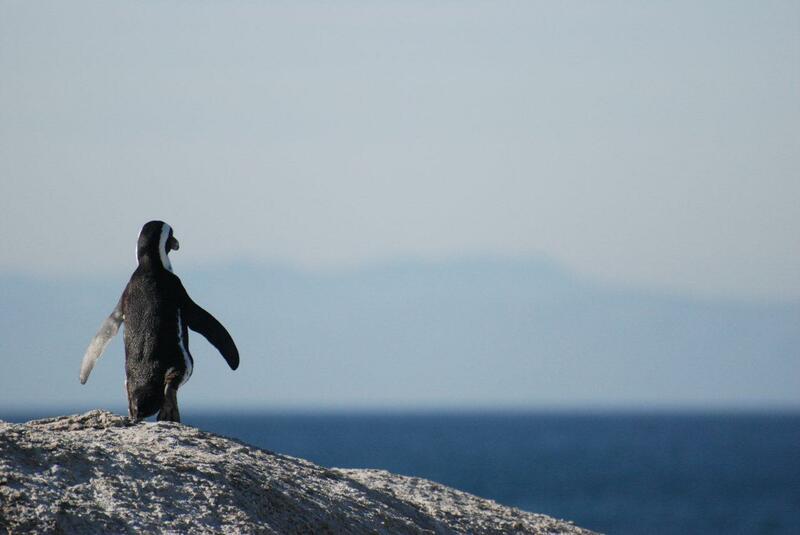 The next day, we grabbed breakfast at “Lola’s Cafe” on Long St. (get the Eggs Lola – amazing) then headed to Boulder’s Beach in Simon’s Town to see the resident penguin colony. It’s a national park so make sure you bring your Wild Card if you have one (we forgot ours and there’s no way to look up your name), but the entry fee is still only about $5USD. We walked along the boardwalk and checked out these neat creatures waddling along the beach and playing in the water. We saw a mother keeping her eggs warm in a little makeshift den and some penguins molting their layer of fluffy gray feathers. We ate lunch in Simon’s Town, a quiet, small community built around the main harbor which doesn’t consist of a whole lot of stores or restaurants. 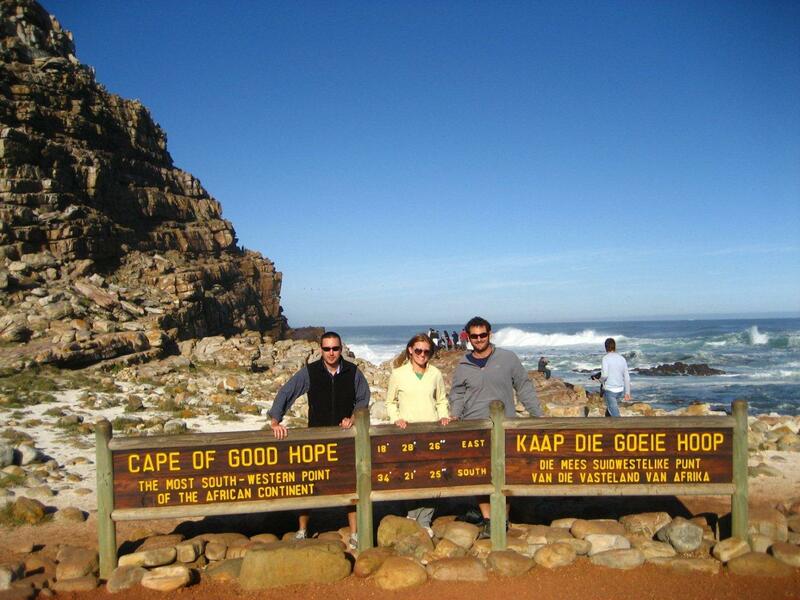 Once fueled up, we drove down to the Cape of Good Hope and Cape Point, situated in Table Mountain national park with it’s claim to fame being the most southerly point of the African continent. Brody, Dave and I hiked a bit and took photos of the place which really is gorgeous – unspoiled by any development and home to several types of plants and animals. We came across a wild ostrich eating close to the water’s edge and a baboon hanging on the side of the road. The weather was beautiful still but a bit windy on the coast. 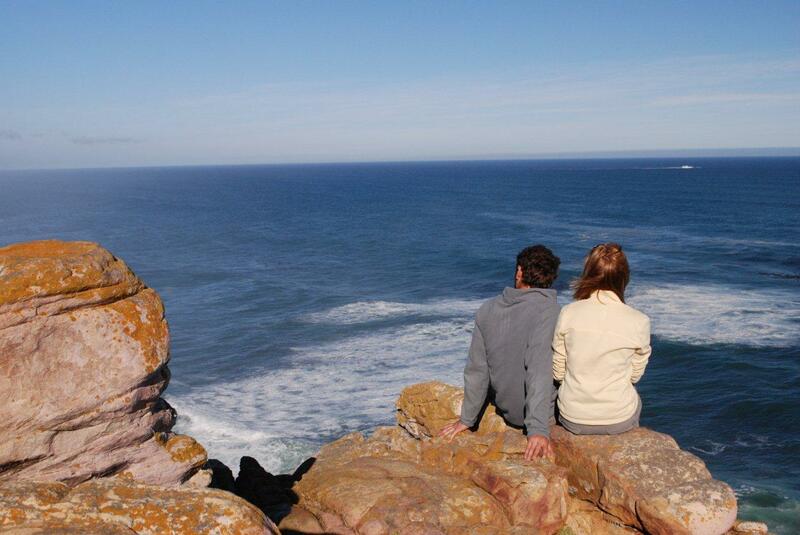 Once leaving the park, we decided to drive up the western side of the peninsula on the way back; driving through towns including Camp’s Bay on the other side of Table Mountain. This drive was incredibly beautiful, similar to Big Sur with the road winding right on the edge of the mountain dropping off into the ocean on the other side (not many guardrails here either). Back in Cape Town, we headed back down to the V&A Waterfront for dinner at a great Thai restaurant before walking to Greenspoint Stadium for the Holland v. Cameroon match. 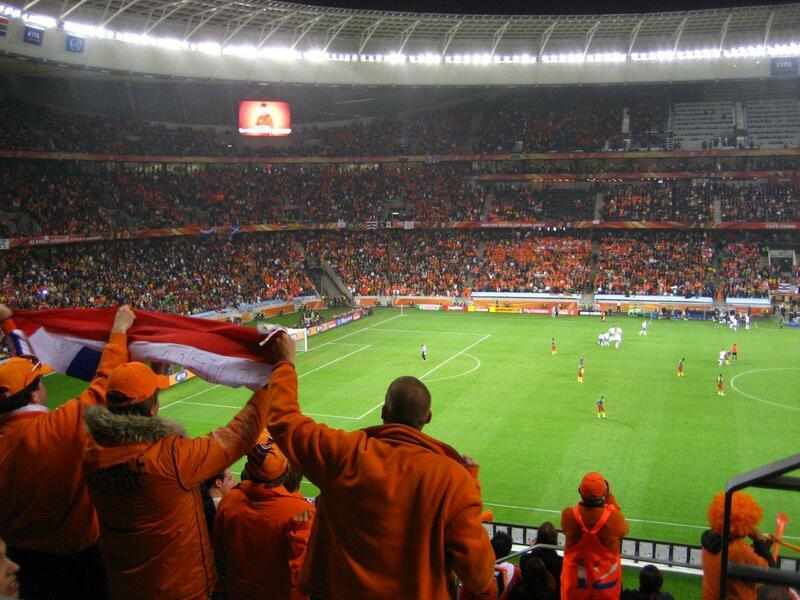 Unfortunately for us, Holland was already through and Cameroon out, so the game could have been much more interesting. The stadium is beautifully designed architecturally, and super efficient. We got right through security, and the best part was that the bathrooms had their own level in the basement and never got crowded. I’d have to say this was the best stadium of all that we’d been to. I wish we had more time to spend in Cape Town, it seems like a city so diverse and rich with cool pubs and restaurants and shops, including the Greenspoint Market which we didn’t have time to get to. 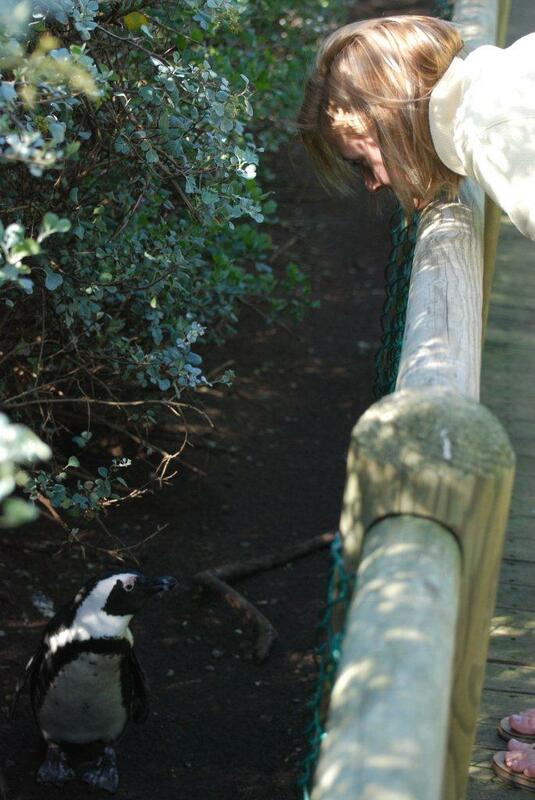 On my next trip, I’d spend probably a week here – including more time in Stellenbosch/Franschoek and surrounding areas.